Polar Forces: universe of an iceberg 2012 stems from a residency I undertook while sailing the Arctic waters of Svalbard on a tall ship 2012. 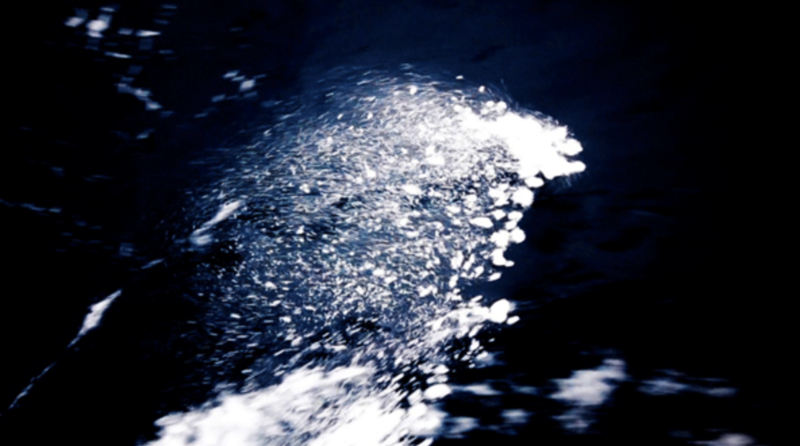 As an artist I explore methodologists of investigation of non physical phenomena, particularly ideas of water memory. I parallel scientific methodologies along side more intuitive process of understanding these phenomena including homeopathy. 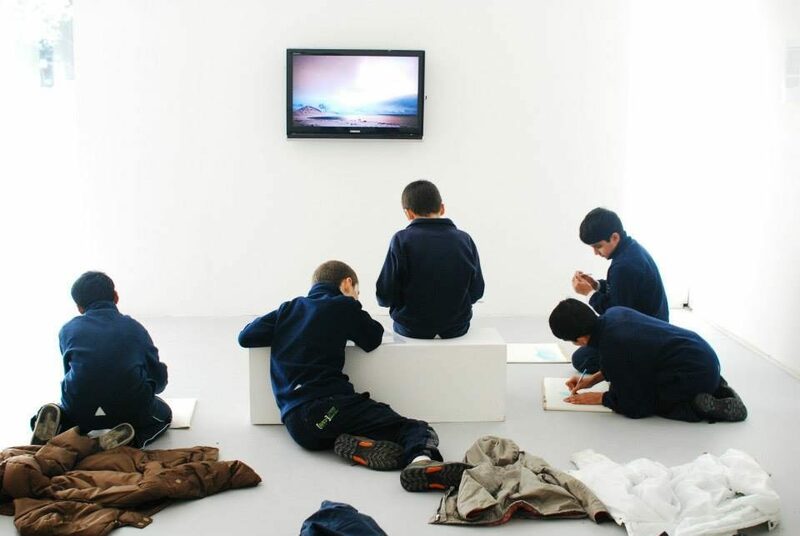 These methodologies are polar opposites but I feel that crucial connections are involved in perception and a unified experience is created from differences. I adopt a practice based epistemology regarding tacit and explicit knowledge as intimately inter-linked and inseparable. 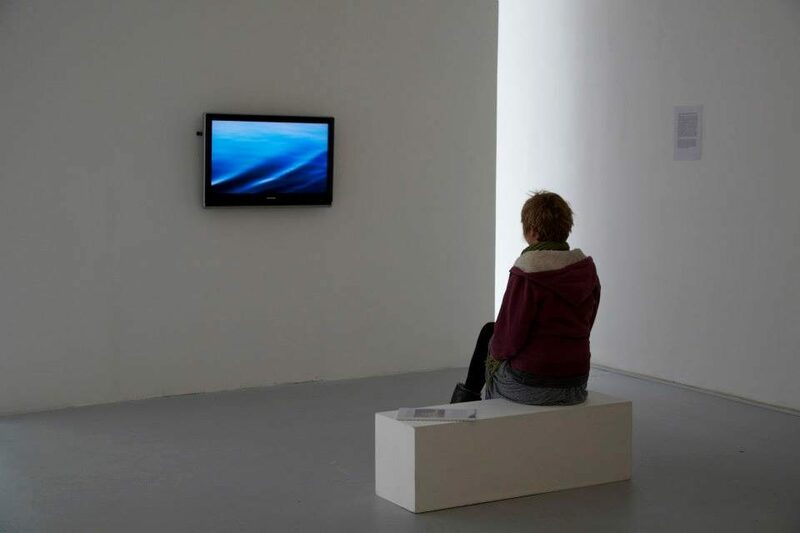 I realise my work through moving image, still image and installation. 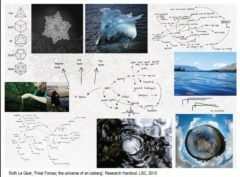 This emerging body of work stems from an art and science residency I undertook in the Arctic waters of Svalbard in 2012 on board a tall ship for a number of weeks. I researched and experimented the micro and macro forces of ice in the retreating ice flows. My practice involves an engagement and meditations with the landscape, making visible the invisible by creating a tangible response to forces that are not immediately apparent. 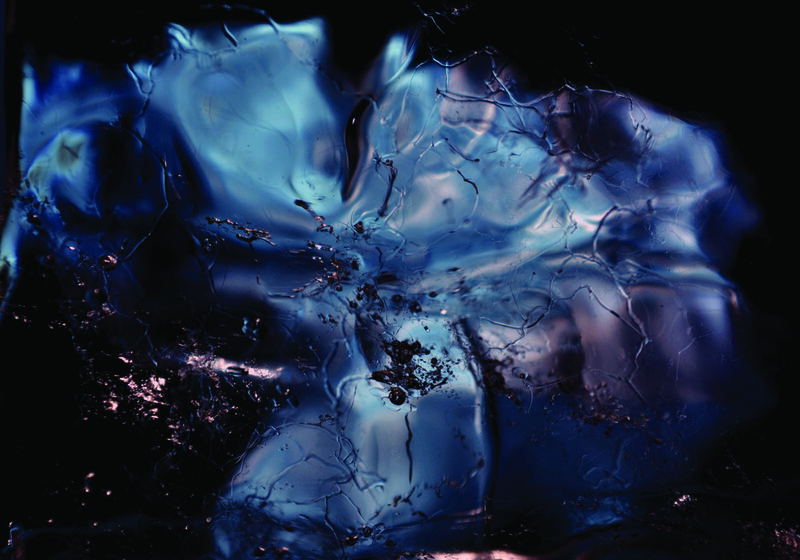 Utilising the methodologies of homeopathy, I unravel shared experience through water. My process involves serial dilutions, where each iceberg sample is explored to see what is held within. Substances which have been submerged or diluted in water, leave a trail or impression. There are varied resonances which were locked inside icebergs; that which was frozen for a time is now being released. The remedies, based on homeopathic processes of serial dilution form tiny poetic time machines where each ice sample is explored to see what was held within it. The iceberg remedies initial intention was for the land and other water bodies, to bring an resonance of the climate change to other water bodies. The contradiction of a remedy made from water and diluted with itself presents interesting questions around the uses and permutations of a landscape whose energy-fields mediate and co-exist with the human body. This work reflects on the ephemeral and delicate sense of loss, causing us to contemplate on the contemporary environment we find ourselves in. We are living in world where we only see the tip of the iceberg, big energy in little spaces. Somehow there is a vivid burst of brilliance, like fireworks, a healing light in a hazy apparition. 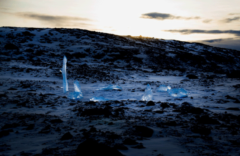 Within the exhibition I present portal images of ice as microscopic views: inversely exploring what we can otherwise never quite take in, that universe of the iceberg – the submerged, the visible and the invisible – that which has melted. 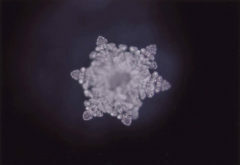 I also worked with Masaru Emoto, who is best known for his claims that human consciousness has an effect on the molecular structure of water. Emoto’s hypothesis has evolved over the years of his research working with frozen water crystals. He believes that water takes on the resonance of the energy, which is directed at it, and that polluted water can be restored through prayer and positive visualization. He shows this through changes in the crystals exposed to different words and sounds. 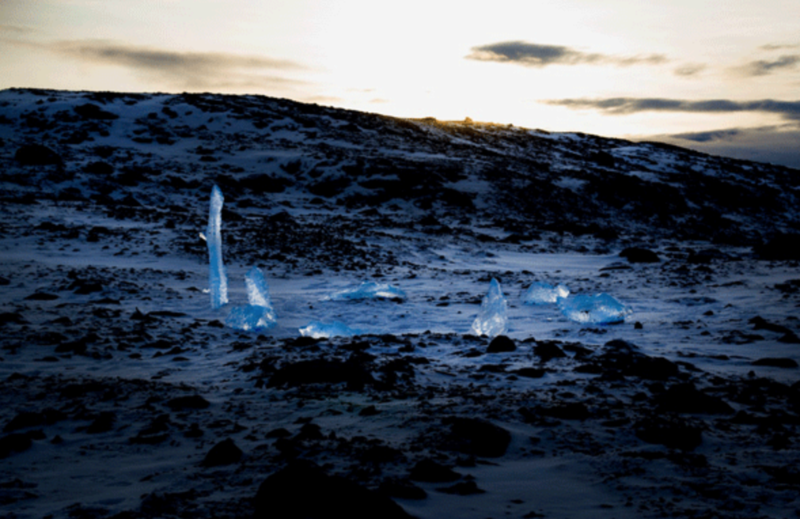 He grew a crystal for me from the meltwaters of an iceberg from the Magdalena iceberg. I further explored the potentiality of ice in terms of water remedies resulting from fieldwork investigations of the north Leitrim glacial landscape over the past year, to bring an awareness of this vast melting to a site where a huge glacier once existed. 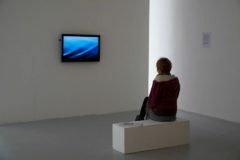 Le Gear began resonating with the emotions embodied on the landscape and trying to meet their polar opposite vibration through a ritual conversation with the lake water and an iceberg. 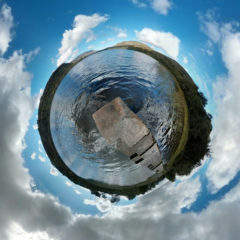 The waters of Pooleybyrn in the Arctic have shown to be for jealousy, mistrust and heartache. 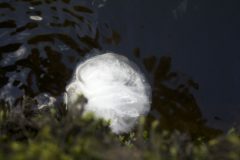 Frozen meltwaters of an iceberg from the pooleybyrn glacial lagoon were created into a remedy in the form of a frozen sphere and given to the lake at Glenade. 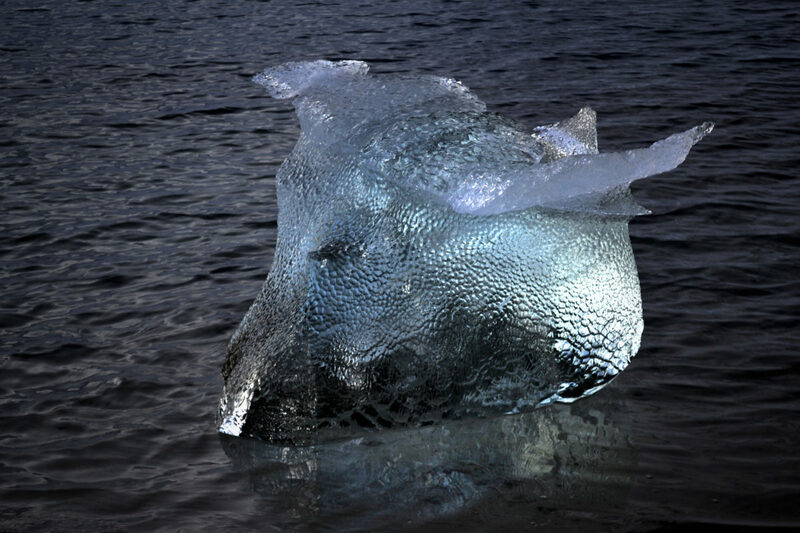 I made this remedy from the an iceberg in the Pooleybyrn glacial lagoon. As a remedy it brings laughter and purity to ones physical and emotional bodies and grounds one, especially in relationships and in those going through break ups as well as reconnecting. Exploring unconscious frequencies within the residue of substances held within the water I initiated empathy with the landscape and the chemistry of myths held within the space. Journeying inside of the water I tries to be apart of it, like a shaman who enters a trance state during the practice of divination and healing. Water which can hold a ship up and slip through your fingers, which has the ability to record information and pass it another body of water. Something which has been submerged in it or diluted in it, or passed through it as if locked inside an iceberg, for a time. If I were an iceberg I wonder where I would go?